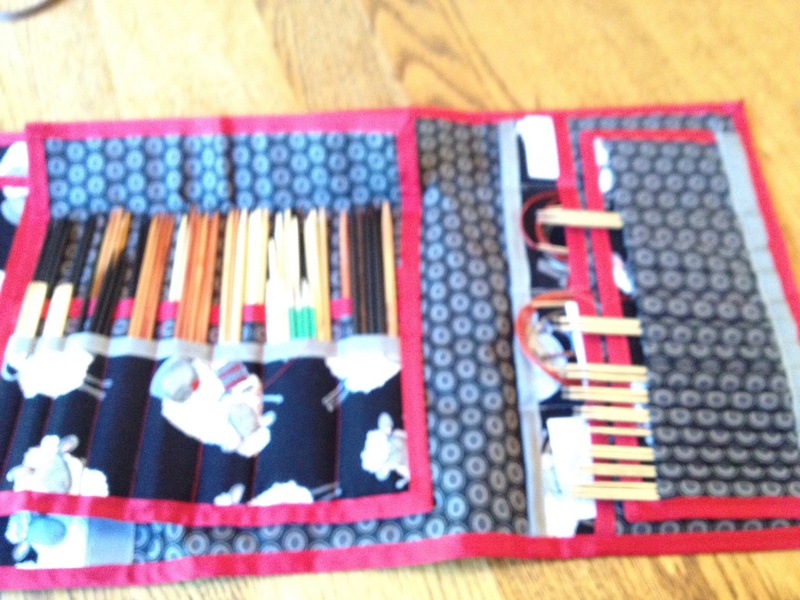 I am somewhat obsessive about knitting needles. I have definite preferences and I know what my favorite needles are. I keep trying others just to see what is out there, and because some projects or yarns need different kinds of needles and different points and surfaces, I keep on buying needles. I think of my needles as a carefully curated collection. 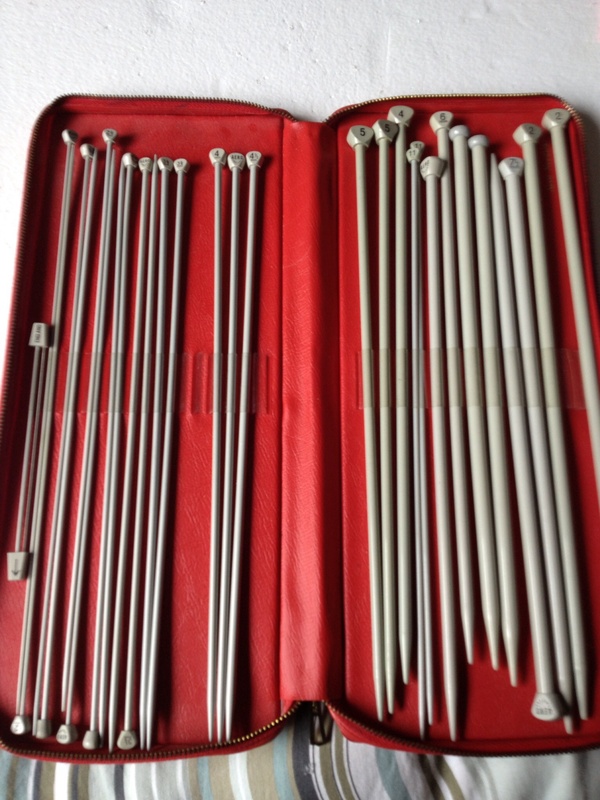 My first set of needles appeared in the beginning of the 1970s, with this collection of Aero needles, in a cute red case. They are 14 inches long, moderately sticky, have medium points, and are marked in English sizes. I keep them mostly for nostalgia. This part of the collection is a random assortment of needles collected over the years. 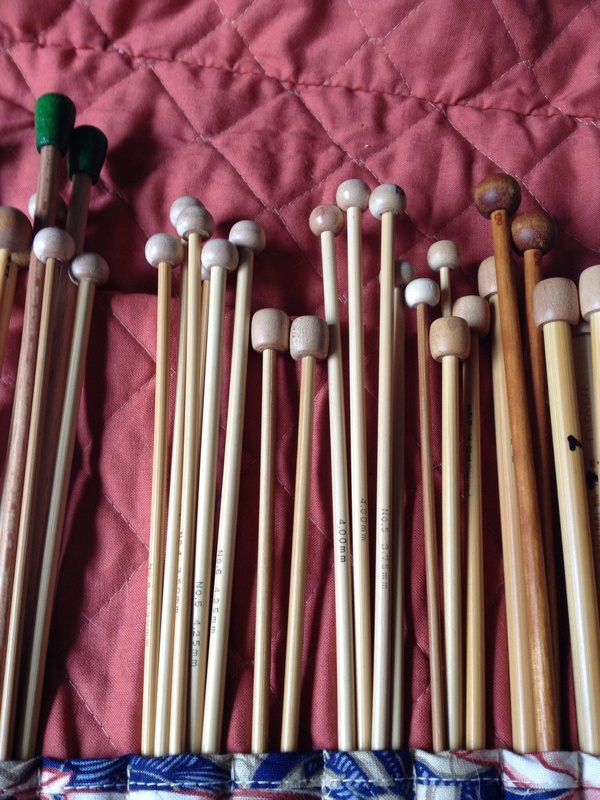 It includes one pair of handmade wooden needles with round knobs and one pair of painted knobs, some more Aeros marked in millimeters, some Susan Bates aluminum (the ones I learned to knit on) and a few other oddments. 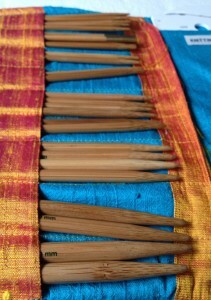 Next is a small grouping of wooden needles, I think made by Colonial, 12 inches long with nicely turned knobs. I do have a collection of double points, some bamboo, some ebony, some rosewood and one set of 4 inch Signatures. Mostly I knit socks using one circular with the magic loop method. I do use DPNs at home for small circumference knitting such as the top of hats, sleeves on baby sweaters, and starting circular projects. The best small needles are Crystal Palace bamboo. They have nice points, and the bamboo is infused with some kind of hardening material making them difficult (although not impossible) to break. I also have Clover bamboo in larger sizes (US 4 and up) for sleeve cuffs, and some lovely Darn Pretty Needles in small sizes that are 4 inches long and useful for the fingers on gloves. There are a few sets left of brands I will no longer use such as Suzanne’s ebony. These are so blunt doing even a K2Tog is difficult. I had a set of Blackthorn carbon fiber DPNs but they were so sharp they could have been used to start an IV. Sold those babies to a friend who thinks there is no such thing as too sharp. Next we move on to interchangeable circulars. I work on so many projects at a time that, despite have an extensive collection of fixed circulars (which I prefer) I like having the sets in case all the fixed ones are in use or on a walk-about. 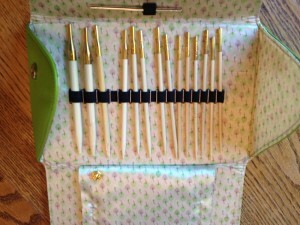 My first set of interchangeable needles were a set of Denise plastic needles. I kept them for about 3 months and then got rid of them. 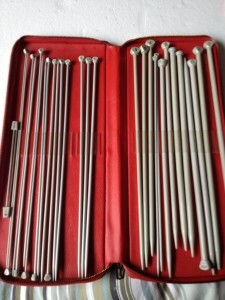 I seriously hated these needles. The cables are so thick that unless you are knitting on a US size 7 the stitches had to be pushed or pulled along on the cable and onto the tip, which stretched out the stitches and slowed my knitting to a crawl. The points are so blunt they are difficult even to knit stockinette and complex maneuvers were impossible. 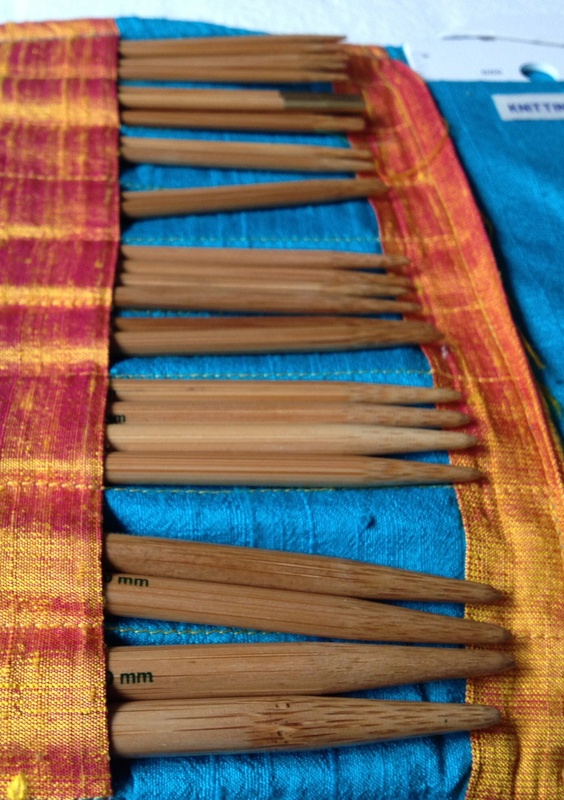 Next I tried a set of Knit Picks Harmony. They were okay for a while but the joins were not as smooth as I like, and they loosened as I knit and ultimately the tips and cables came apart. I liked that they were inexpensive but for me on this item you get what you pay for. These were given away. Very similar to the Knit Picks are Dreamz, and I have a few fixed circulars of this brand. The join is not smooth and yarns catch and pull. 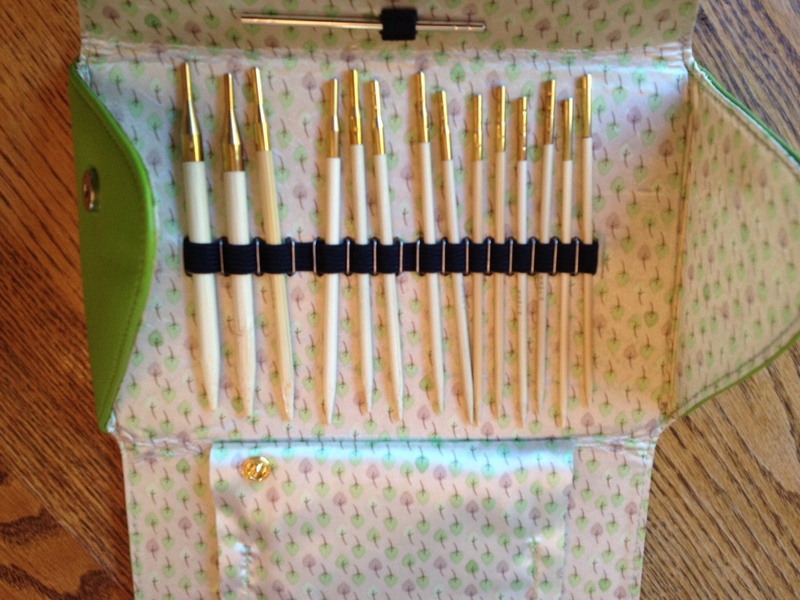 This is a set of bamboo interchangeable needles. Senior moment on the brand -maybe someone out there can jolt my memory? They have moderately blunt points, with medium smooth joins but the taper on the point is a bit short for my taste. There are lots of cables with cable connectors so you can put 2 cables together for a really long needle. I used these on a sweater made of merino tape yarn because points any sharper would split the yarn too easily. I did have some trouble with sliding the stitches over the join. I have to admit that the main reason I keep these around is because of the neat case, in orange and turquoise sik. I’ll go into what I like in knitting bags later, but I am a sucker for neat packaging. 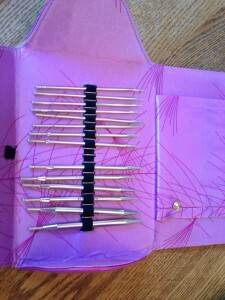 Although the turbo needles are marketed as “lace” needles the point is not sharp enough for complex stitch combinations. I know these are a favorite with lots of people but, as my mother would say, to each her own. Both Addi sets come with a connector so you can combine two cables for an extra long circular. The connector that came with the turbo set doesn’t fit the cables and cannot be used. And the connector that came with the bamboo set once came apart in the middle of a large lace project resulting in a torrent of swearing and a whole bad day that was needed to recover and repair. Fortunately the yarn was merino and not silk or cashmere which would have been a total disaster. I will not be using the connector again. Without the connector the turbo needles worked extremely well on a sweater for my son-in-law with slightly fuzzy yarn knit on a size 9 needle – which to me felt like broomsticks. Bamboo and even ebony needles were too grippy for the yarn. Currently on a walk-about somewhere in the house is a set of Hiya Hiya 4.5 in interchangeables. The case is the best part of these needles. The points are excellent for lace but the join is kind of rough and has come apart while in use. If I need the sharpness of a Hiya Hiya I use one of the fixed circulars I have. And for socks I almost always use a 32 in. US size 0 Hiya Hiya; very flexible joint for magic loop, and the join is excellent on the fixed circulars. 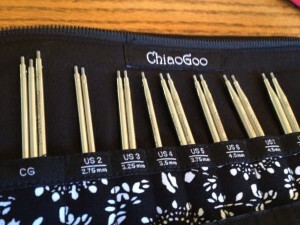 Next up is my favorite set of interchangeables: Chiao Goo Red Lace needles, “small” set (US 2-8) with 5 inch tips. The points are sharp enough for most lace maneuvers but won’t pierce your fingers. The joins are smooth and stay connected. There is a little tool used to tighten the connection, so there is a little hole through which you can thread a lifeline. This method of using a life line only works if you don’t use ring markers because those will end up on the lifeline and cannot be removed until you take out the lifeline. It should work fine if you use moveable markers, the plastic kind that look like safety pins or rings that aren’t completely closed. You can get an extra set of points in 3.0 mm, which I use frequently. And they come in this really neat case with room for the cables, stitch markers, and a variety of small tools. 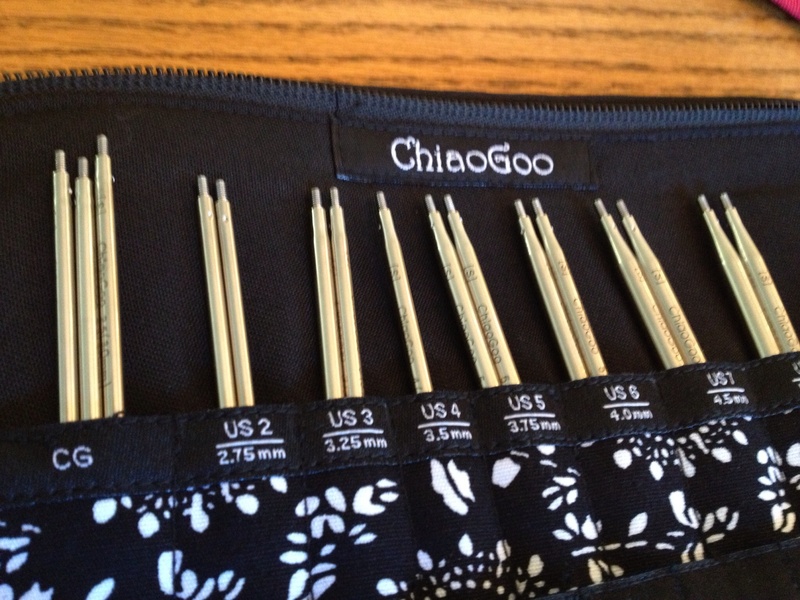 Oh, did I mention I have a second set of ChiaoGoo interchangeables? 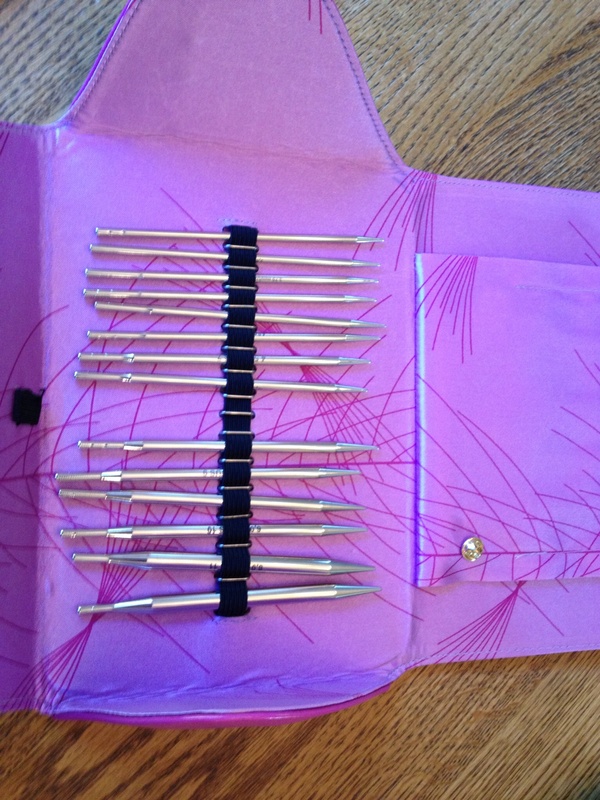 This is my travel set of needles. The case is by Erin Lane and it holds a full set of interchangeables (did I mention I have 2 sets of ChiaoGoo?) It also has room for a large selection of DPNs, and a small selection of fixed circulars as well as a pocket for cables, stitch markers, and other small notions. The needles that I actually use 90% of the time will have to await another post. Time to knit! This entry was posted in Uncategorized on October 25, 2013 by nina@ninaknit.com. Kitchener stitch is a way of joining two sets of live stitches. Useful for the toes of cuff-down socks, underarm stitches left on hold, and a variety of other knitting situations where you want a flexible join with no visible seam. I don’t recommend this for the shoulders of sweaters; it is so flexible the shoulder will stretch too much. Start: have an equal number of stitches on two needles (or two ends of the same circular, or on a thread). Cut the working yarn with a long tail. Hold the wrong sides of the work together, one right side of the work facing you and the other facing away from you. Thread the yarn through a tapestry needle (TP). Set-Up: Front needle – put the TP in the first st. as if to purl. pull thread through and leave the st. on the needle. Back needle – put the TP in the first st. as if to knit, pull thread through and leave the st. on the needle. put TP through st. in back as if to purl, slip st off; TP in next st. as if to knit an leave on needle. START: Front: P on. Back: K on. CONTINUE: Front: K off, P on. Back: P off, K on. Work loosely to match gauge of knitting; this can be tightened but loosening is difficult. When done correctly the resulting join looks just like a row of stockinette stitch. It can also be done in other patterns, including garter and rib, but those are for another day. This entry was posted in Techniques The Easy Way and tagged joining on October 22, 2013 by nina@ninaknit.com. I have been knitting for almost 60 years. I learned as a small child, sitting on my mother’s and grandmother’s laps. Although their relationship was strained at best and despite the fact that they came from different parts of the world, they both knit the same way: holding the yarn in the left hand, making new stitches with the right (working) needle, and purling so the working needle moves counter-clockwise to scoop up the yarn. The yarn is mounted on the working needle so the stitches to be knit on the next row have the leading leg to the back. If this stitch is then knit through the back leading leg, the result is a nice even stockinette stitch. This method of knitting has come to be called a variety of names: Eastern uncrossed continental, combined, anarchist, and often, wrong. I prefer the easier and more descriptive name, Purling the Easy Way. It is base on continental or picking, with the yarn in the left hand, and the working needle scooping up the yarn to make a new stitch. My second knitting project, after the inevitable garter stitch scarf, was a complex Aran sweater, using imported Irish yarn that had some lanolin left in the wool. No one told me multiple cables were difficult, and with some help from Minnie, the local yarn shop (LYS) owner (whose lap I also sat on), I worked my way through the sweater. I learned two things from this experience: that something is not difficult if you knit stitch by stitch, and buy (or reserve) all the yarn for a project when you begin. I ran out yarn for the second sleeve and could not get the same dye lot. The second lot was significantly different (since it was undyed perhaps it was from different sheep or shepherds). I never wore the sweater because the colors didn’t match. But I digress. As I kept knitting through junior and senior high school then college and law school, for the most part I knit in isolation. Occasionally I would meet up with someone else who knit and it was such a novelty that we never actually got around to compare how we knit. Then in the 1970s I came across a book called Knitting Without Tears by Elizabeth Zimmermann. I discovered that I knit “the easy way”. Finally it made sense to me why my decreases all looked the same and half of them were different than pictures in pattern books. In my knitting, knit 2 together (K2Tog) and slip, slip, knit (SSK) looked the same. For both maneuvers I was knitting two stitches together through the back loop, but not twisting the stitches, which resulted in a left-leaning decrease. I didn’t understand why for some of those decreases I had to slip the stitches first and put them back on the (left) holding needle. I didn’t know how to make a right leaning decrease. EZ explained that although it was easier to purl this way it was not the standard way, and would require modification of directions in most knitting patterns. So I set about a journey to understand how knitting worked, how to modify what I did and “unvent” ways to make my knitting look like the pictures. None of these modifications are rocket science or even particularly complex. And to this day I don’t understand why knitters insist on purling with a flipping finger or wrist twist when The Easy Way is so, well, easy. I don’t hate purling; I even will knit garter stitch in the round (knit one row, purl one row). This blog will primarily devoted to Purling the Easy Way, including working preparation rows on the wrong side of patterns including lace, so that on the right side rows all the stitches are mounted as they will be worked, with no removing or remounting. Ordinary patterns and maneuvers can be worked without damage or pain in the left hand by twisting or flipping and there is no “rowing out” on purl rows. Your knitting quickly motors on with elegance. 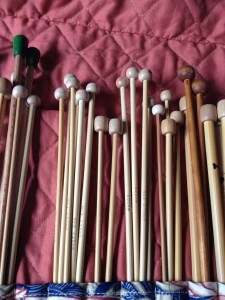 Along the way I will probably add other topics close to my heart, including how to modify patterns to fit, my thoughts on knitting needles, and a variety of other topics in knitting. I hope you will join me in this journey and that it will help make your knitting life easier and more fun. This entry was posted in Uncategorized and tagged ELizabeth Zimmermann, knitting maneuvers on October 22, 2013 by nina@ninaknit.com.